Morning was busy with every one getting ready to start an early descent. 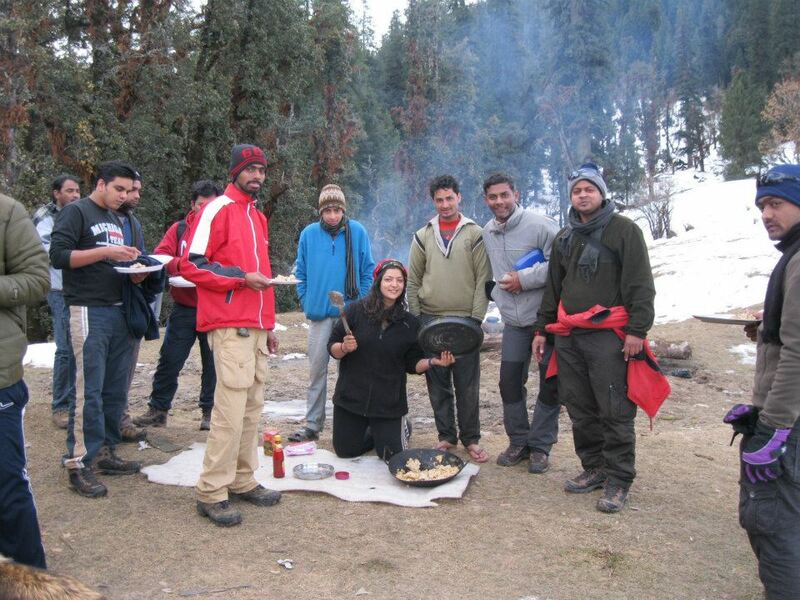 The kitchen staff were now preparing the most delicious Parathas with Egg Burji. I was so glad I eat egg, the combo tasted so well. The demand & supply was never balanced & naturally a long queue waited right outside the kitchen tent for their turn to get a hot paratha on the plate. Must say I ate greedily! One of the Parathas from Suma's hand got grabbed by the dog battalion and there was roar in crowd feeling sorry for suma or a display of anger for the negligence. The dogs ran away with it & swallowed within seconds. The pace of the team to reach the base camp & start their next journey towards different places was high enough not letting us take much break. The group was almost running down the trail. And finally Sankri was visible, not too far on the downhill. 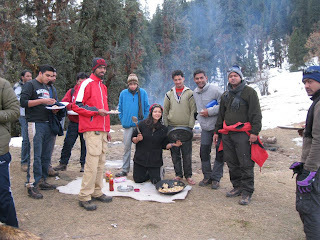 On reaching the Base camp, we waited patiently outside the IH office till a hot tea & biscuits came in. Raj Mohan ji was here to welcome us with a clean shave looking much younger than he looked before. The ceremony to distribute certificates started with the crowd cheering after calling out each name who would proudly come up to collect his token of accomplishment from Raj Mohan ji & Bharti. Meanwhile our luggage got loaded into the vehicles which would drive us back to Dehradun. The last night we had planned that we would visit Rishikesh & Haridwar. The drive back to Dehradun was much easier with a small nap albeit curvy roads. The tired body made no complaints for the bad roads and slept quietly till it reached the city of Dehradun by night almost at dinner time. We checked into a hotel close to railway station and helped ourselves with food in a ok-ok kinda hotel. After a long time we would be getting to sleep on a bed, dirty though but who cared. Sleep had to win over all odds around. 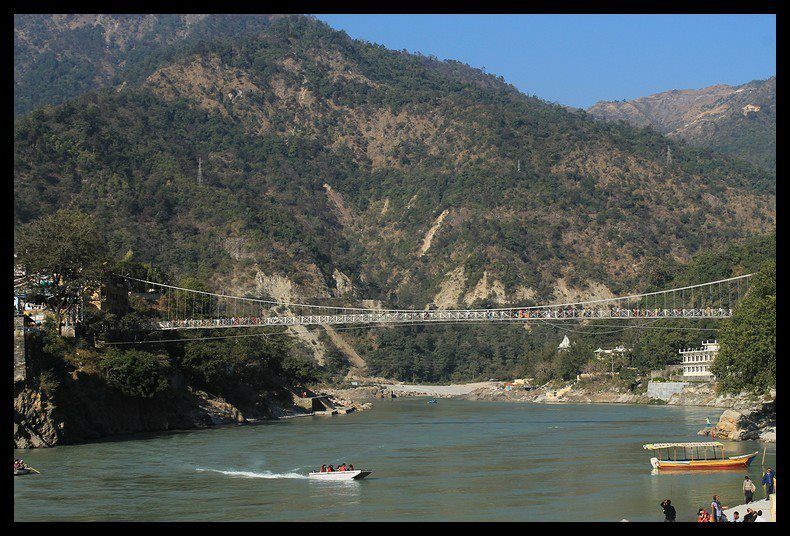 The next day was to drive not more than 1 hour to reach Rishikesh. Ram – Lakshman Jhula was since long in my travel list. 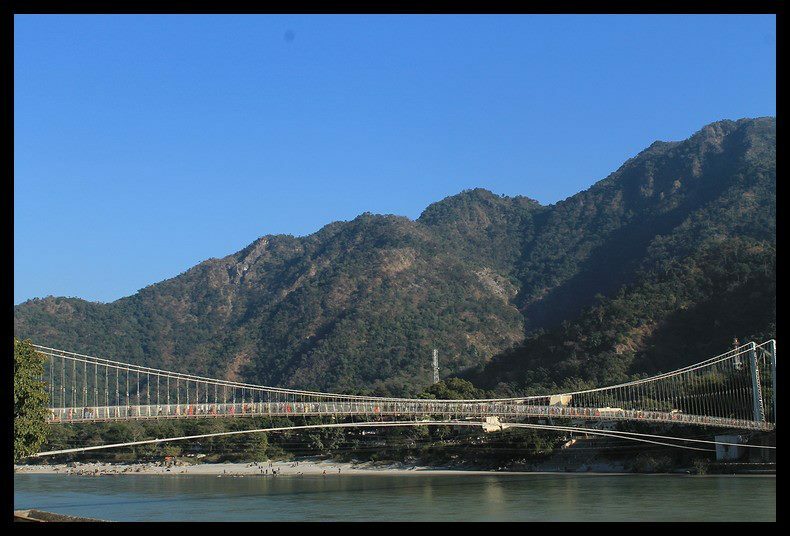 For its serene ganga following below these bridges, the beauty is beyond consumption. The Sun spared none but it was welcoming. This place as well is crowded with Phirangees roaming in odd colored clothes. Many young lads throw themselves on this river bank drinking alcohol in a place with is otherwise known for its spiritual richness. Numerous yogis have made this place their home and hence considered to be THE place for anyone who is looking out for spiritual growth. Several times in the past I had thought of coming here find a guru to learn Yoga, now I was forced to think twice. Haridwar wasn’t too far but it was already evening & had to skip the visit to the temple with a hope to visit these places again. We drove back to Dehradun to catch a night train back to Delhi. We met Danny, Imran & Shimoo in the railway station who had watched Dabaang-2 to kill time in the city that day. We reached Delhi the next day morning around 8AM. Danny & Imran departed to airport while Shimoo had all time on earth to accompany us to Akshardam. Yes! I finally made it to this beautiful temple. The very first sight of this temple is breath taking. The security was pretty appreciating, me & Suma got all possible strange looks for the tracks and huge shoes we wore. The temple has a long garden stretched out. Cleanliness was prominent at every corner of the temple complex. User friendly boards, audio tapes helps one enjoy every statue and architecture throughout. I so much wish a similar setup in our heritage temples back in Karnataka. It would be so appealing if places like Hampi, Halebidu, belur, Aihole, Patadakalu and many more places having their stories put across in such simple way for everybody to understand and appreciate. Without even our knowledge we had spent close to 6hrs in this place. The story of Swamy Narayan depicted in the form of a movie is so creative. Except for the evening’s musical fountain we missed nothing in this place. We took an auto back to Nizamuddin station from where me & Suma were to catch Rajdhani express. We both were so very excited about this train journey right from the beginning of this holiday. We had dinner outside the railway station, a uniquely awesome ambienceof this place helped us kill time. Shimoo dropped us near the train & said bye to us from here to catch a bus to Ambala. He was fun to be with & a great company in Delhi. We occupied the side lower and upper birth and sat there the whole day & night watching the train cutting across the length of this country. We never checked our mobile phones or watches for time. Slept for more than half of the journey and plugged my ears to some good music. Book dint taste me much than sleeping like a lazy bug. I dint even realize that it was the start of a new year when we got down at Yeshwantpur railway station in the morning of Jan 1st 2013. It’s a Happy wala New Year!! When ever I am writing about the day of summit I am as excited as I am on the day of climbing it. All of us would have had imagined the peak in our own way, and would wait for this day to actually experience it & no wonder the summit is way beyond one’s imagination. It is difficult to capture its beauty with anything be it with words, a camera or your beautiful eyes. With yesterday’s good night sleep we were full of energy to conquer the summit. With our crampons on, walking on the snow became much easier. With its fine grip it was difficult to fall off balance. The climb started early by 7am. 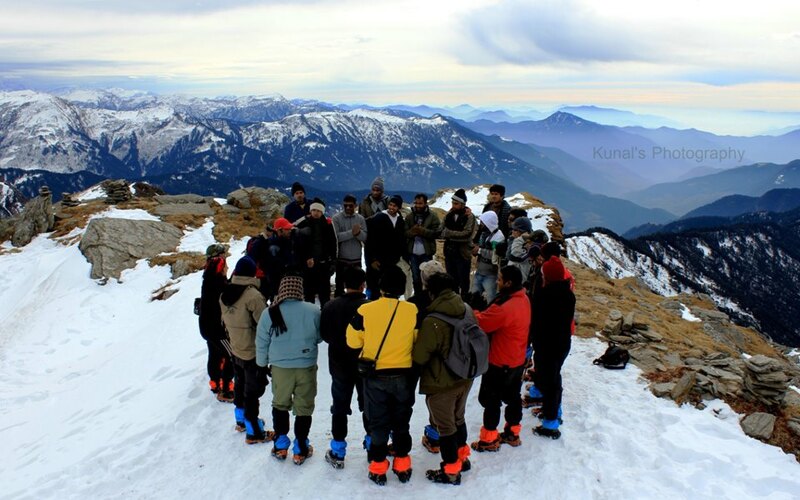 The weather was clear with enough chill to keep us shivering as we reached summit. Initially I managed to walk without my gloves but soon the blow of wind was so quickly made my hands go numb. I then managed to play with my camera with my gloves on. We stopped to see Raj Mohan running on the edges of the mountain and climbing the trees like a monkey to catch signals on his walkie-talkie. He seemed least worried about the steep cliffs and slippery snow, having been on these mountains since his childhood made him feel at home. As we reached the summit, the blow of cold wind increased. Few among us with woodland shoes had tough time keeping away the ice & the wet shoes troubled them for the rest of the day with frozen feet. The summit was spread wide enough to accommodate all the climbers on it. Right on top a typical arrangement of flat stones in a square on which a trishul was crowned. Few prayer beeds hung on this trishul and Gharwali people being extremely god-fearing will not entertain even the slightest disrespect towards god. Raj Mohan ji on reaching summit, kneeled down and spent some time quiet closing his eyes, moving his lips chanting the prayers. Inspite of being a non-believer of this whole setup, I was feeling good to see someone pray so innocently & the summit offers all its positive energy by just being there. Few escaped from the crowd to catch some quiet time to embrace the beauty around. 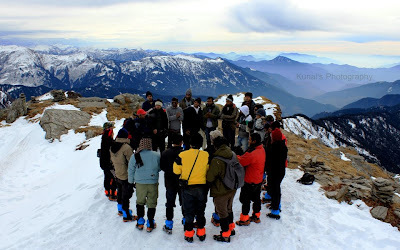 While Raj Mohan Ji patiently waited till the last climber reached the top and then took us around naming each peak surrounding us with its altitude, distance of trek & difficulty levels. The list seemed never ending!! The story of shiva being on this peak get its name after him. After all this Q&A seesions, we celebrated our joy clicking pictures and quickly started to get down the mountain back to the base camp. The snow was very dry not letting us enjoy a good slide. We still managed to slide down short distances at the cost of hurting our back sometimes. Back in Kedarkantha Base camp, a yummy lunch welcomed us. 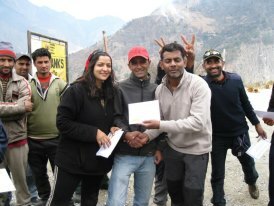 My Schoolmate Mahesh was in the next batch which had already arrived at the KK Base camp. His friends had cursed me throughout their trek for suggesting this trek. I could see their frustration of being in this cold instead of enjoying a nice holiday on their bikes. This was not their cup of coffee. Har gaon was a beautiful place to relax after the summit but this was lot more colder and windy than the previous night. We threw the bags into our tents and went straight to get some warmth around the fire. The fire was not lit up yet, troubled few people in the group and I still remember how rudely this guy(I don’t want to mention his name) demanded the campsite person to get the fire ready right away. I felt extremely sorry for Pavan(Raj Mohan ji’s son) for becoming a target. Providing this basic facility itself is way too difficult than we imagine & instead of being grateful we offer no sensitivity for human values. Over the night I saw Pavan & another guy walking into the dark holding huge bottles to bring drinking water for us. My heart sank in pain. When it was impossible for all of us to stay away from fire even for a minute these people are struggling so much for our well being. I can probably not forget Pavan’s helpless face for long time. From left, Pavan & Thirappan Ji. 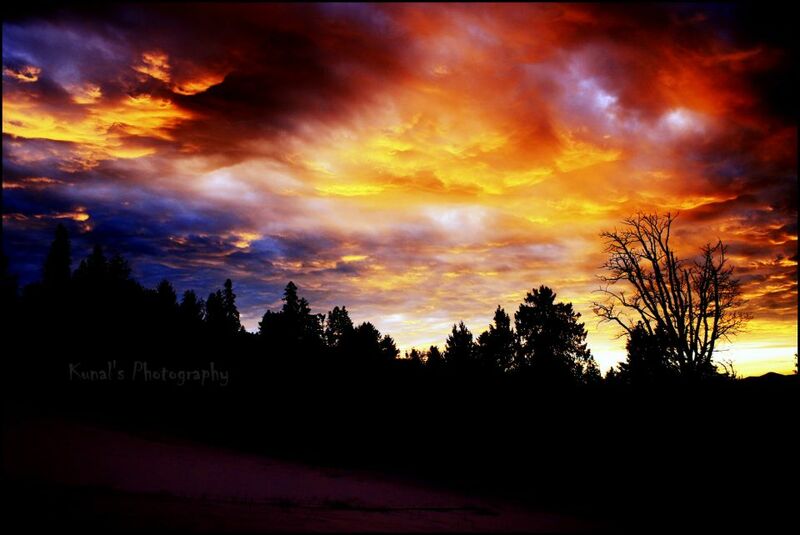 As the sun went down, the sky changed its color every second. It was mesmerizing to see the nature so beautiful & dynamic. The cold was too unbearable and the campfire seemed the best place to spend our night. But strangely Snowy & two other dogs kept barking every now & then keeping us wonder if there were any animals close to the camp site. We flashed torch lights into the dark to see nothing but snow all around. As we stood around facing the fire, our back would freeze and forced to turn around to make it feel better. After several rounds of facing and turning back to fire, Danny came up with an idea to stand with your side facing the fire. Ah this one worked. Ghost stories soon occupied the discussions after we ran out of topics to munch on. And finally when it was too late to sit around the fire any longer we went into our tents and locked ourselves inside the sleeping bags. Our dog battalion barked the whole night keeping us almost awake throughout.